Chance Colburn is learning just how difficult it is to say sober and make a comeback, but he knows that his deal with Clay Benedict’s Shooting Stars label may be his last chance. His star status in the country music world was not just dimmed; it was almost obliterated by his self-destructive behavior that included DUI charges, an arrest for public drunkenness and indecency after a nudie stroll down a Nashville street in broad daylight, and other offenses that lost him two record contracts in less than six months and made him country music’s biggest scandal since George Jones claimed headlines. But Chance has a year of sobriety behind him along with a ninety-day stint in rehab and four months in a sober living facility. He is set to cut his first record on the Shooting Stars label in a month. But first he has to find a way to end his songwriting drought and to get along with his label’s PR director, who has a very good reason to loathe him. When an unexpected meeting at a local club exposes Naomi’s current boyfriend for the scum he is, Chance becomes her protector. As they begin to spend time together, it is clear to both of them that they still have feelings for one another. When a vulnerable Chance allows Naomi past his defensive walls, it looks as if they can make their relationship work this time. But Chance’s demons are deeply rooted, and when a crisis confronts them, his distrust drives Naomi away. An HEA seems an impossibility for this couple. 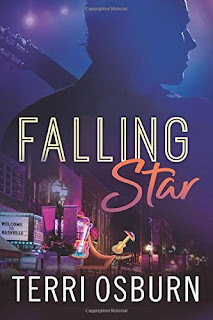 Falling Star, the second novel in Terri Osburn’s Nashville-based Shooting Stars series, is a darker, more intensely emotional tale than Rising Star, the story that introduced the series. Naomi is a sympathetic character from the beginning, and I found her more appealing as the story developed, showing her strong enough to forgive and strong enough to survive another, different kind of betrayal. Chance is more complicated and less sympathetic at times. His inner darkness has multiple layers, and Osburn does not simplify his battle with alcoholism. She shows that any victory in that arena is one that must be won again and again. Reunited lovers and redemption tales are tropes that generally prove irresistible for me. Finding them combined in a single story with protagonists who are flawed, interesting, and believable pretty much ensured that I would love this novel. I’m a country music fan, making the setting another plus, and Osburn’s affection for Nashville came through clearly and added to the appeal. So does a strong cast of secondary characters. Fans of the first book will be pleased that Dylan and Charley make an appearance, and Shooting Stars owner Clay Benedict and Chance’s manager and step-sister Shelly Needham will leave readers eager for their stories. Two other things made Falling Star an extraordinary read for me. (1)The grovel scene is a winner because it exacts a cost and because it is not an instant fairy-tale fade to an HEA. (2) The villain gets what he deserves, no more and no less. 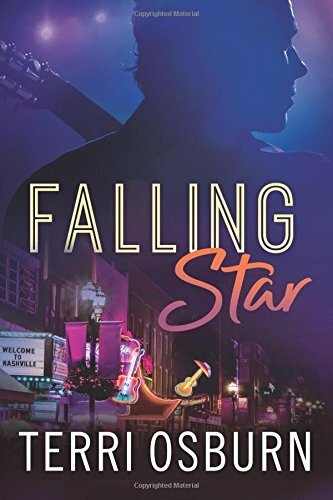 If you like contemporary romance with a country beat, a generous amount of angst, and characters who will linger in your memory, I highly recommend this book. Thanks for the review Janga. I enjoy reading Terri's book and I look forward to reading this series. Thanks for the review Janga. I hope you all enjoy this one. I'm loving Terri's Nashville series.